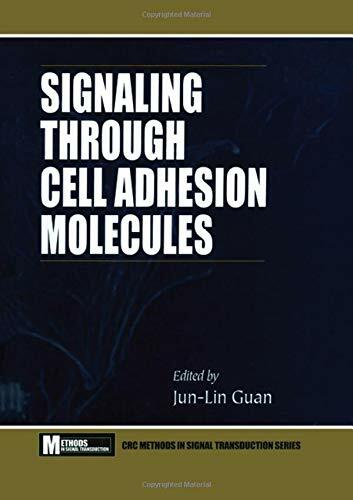 Signaling Through Cell Adhesion Molecules (Methods In Signal Transduction Series): 9780849333859 Hardcover - LIMEROCK BOOKS INC. The field of signal transduction research is one of the fastest growing in all of biomedical research in recent years. Signaling through cell adhesion molecules have long been of interest because of their importance in embryonic development, homeostasis, immune responses, wound healing , and malignant transformation. However, it is only recently realized that cell adhesion molecules are capable of transduce biochemical signals across the plasma membrane to regulate cellular functions. Signaling Through Cell Adhesion Molecules brings together novel and current methodology employed in studies of signaling by cell adhesion molecules as presented by leading experts whose research has shaped this nascent area of signal trandsduction research. One of the unique features of this method book is its topic-oriented format; experts with "hands-on" experience present various techniques and answers to particular biological questions. Many chapters not only contain the "recipes" on experimental protocols, but also discuss the rationale behind their development.